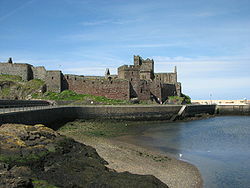 Peel Castle is a castle in Peel originally constructed by Vikings. The castle stands on St Patrick’s Isle which is connected to the town by causeway (or as we like to call it, a road) . It is now owned by Manx National Heritage and is open to visitors during the summer. The castle was built in the 11th century by the Vikings, under the rule of King Magnus Barelegs. While there were older stone Celtic monastic buildings on the island, the first Viking fortifications were built of wood. The prominent round tower was originally part of the Celtic monastery, but has had battlements added at a later date. In the early 14th century, the majority of the walls and towers were built primarily from local red sandstone, which is found abundantly in the area. Excavations in 1982-87 revealed an extensive graveyard as well as the remains of Magnus Bareleg’s original wooden fort. The most spectacular finds were the 10th century grave of “The Pagan Lady” which included a fine example of a Viking necklace and a cache of silver coins dating from about 1030. The Castle’s most famous “resident” is the so called Moddey Dhoo or Black Dog ghost. Legend has it that the black dog used to visit the castle guards through a tunnel, one night one of the guards decided to follow the dog back through the tunnel but after much screaming neither was never seen again. Once inside Peel Castle it’s a short walk up the steps and a turn right to the gatehouse ramparts which offer nice views back over Peel and the bay. Underneath the ruins of this building you’ll find one of the dungeons (or cellar) and the famous giants hand print. Once you’ve done the compulsory “put you hand in his” (and discover that it’s not such a big hand print after all) it’s time to wander around the perimeter of the castle. The castle walls are still largely in good condition and the south west portion provides fantastic views of Fennella beach and around the back of Peel hill. This area of coast is frequently visited by basking sharks during the summer months. 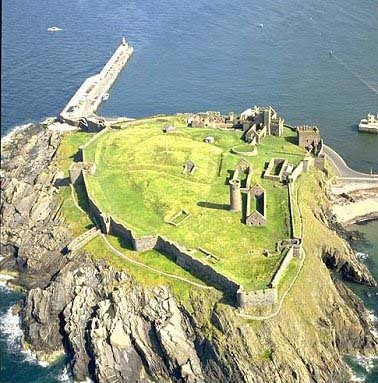 Peel Castle will take a good couple of hours to enjoy, don’t forget to have your picture taken sat on the cannons to your left as you enter the castle! There is parking available in the Fennella Beach car park or on the break water although it can get very busy on nice summer days. For a more relaxed trip out to the castle you may want to consider leaving your car in the House of Mannanan car park and taking a stroll out along the harbour and newly constructed Marina. Once you’ve finished in the castle some of the best rock pooling on the Island is available just around the corner. Nets can be bought from the local kiosk and the upper rock pools are safe to enjoy at all states of the tide. If you’re that way inclined some good fishing can also be enjoyed behind the castle, with plenty of Pollack (locally Callig) to be caught on light float tackle. A trip to Peel Castle followed by some rock pooling and general wandering around the breakwater on a hot summer’s day takes some beating.